Last week, the World Economic Forum (WEF) published its annual Global Human Capital Report. The report is based on the Global Human Capital index, which provides a quantifiable way to measure human capital based on individuals’ ability to acquire, develop, and use new skills beyond their years of schooling and during their professional lives. The index ranks 130 countries and gives each country a score between 0 and 100, which can roughly be interpreted as the percentage of human capital optimization in a given country, i.e., the extent to which countries have optimized their long-term human capital potential. The report finds that the world has developed 62 percent of its human capital while 38 percent of its talent remains untapped and neglected. Norway leads the Global Human Capital Index ranking. Moreover, eight of the top 10 countries with the highest Global Human Capital Index are in Europe. The United States and New Zealand respectively rank fourth and seventh. Yemen sits last, in the 130th place. The report provides data for 29 countries in sub-Saharan Africa. As seen in Figure 1, all sub-Saharan Africa countries perform worse than the global average. Nevertheless, Rwanda and Ghana are performing relatively well compared to their African counterparts and close to the global average. The report attributes Rwanda’s and Ghana’s achievements to their efforts in closing the gender gaps in education and employment, and the improvement in educational attainment among the countries’ younger generation. Ethiopia and Senegal rank lowest in sub-Saharan Africa. The report attributes Ethiopia’s poor performance to high unemployment and underemployment across generations and Senegal’s to poor educational attainment. Kenya has made noticeable progress since the release of the 2016 edition of the report. The country went from a ranking of 102 in 2016 to 78 in 2017. Kenya’s progress is attributed to the country’s strong educational quality and a large medium skilled-employment sector. The report breaks down the Global Human Capital Index into four sub-indices: Capacity, Deployment, Development, and Know-how. Capacity measures literacy and educational attainment. Deployment evaluates employment statistics and efforts toward closing the gender gap. Development assesses the quality of education and skills diversity. Know-how gauges economic complexity, and the share of high-skilled employment. While African countries perform worse than the global average on the overall score, a focus on sub-indices paints a different picture. Mauritius and South Africa perform better than the global average on the capacity sub-index. Both countries rank fairly well in literacy and educational attainment. On the deployment sub-index, Rwanda ranks second worldwide. The report attributes this rank to a large labor force participation rate (73.6 percent), a low unemployment rate (3.4 percent), and notable efforts in closing the gender gap. 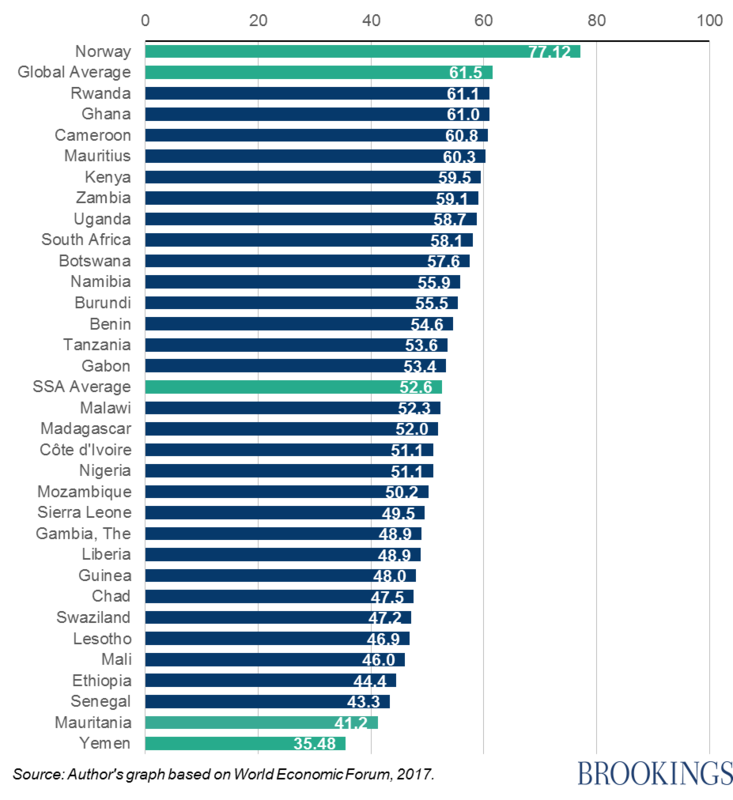 Cameroon, Ghana, Kenya, and Nigeria also perform relatively better than the global average. Mauritius performs better than the global average on the development sub-index. The country benefits from the quality of its educational system and the high quality of staff training. Benin performs better than the global average on the Know-how sub-index. The country has a relatively high availability of skilled employees and a relatively high share of medium-skilled employment. In conclusion, an overview of the Global Human Capital Index shows that African countries score below the global average when measuring human capital optimization; however, a look at the sub-indices provides a more nuanced picture. For example, Rwanda is not only performing better than its regional peers, it is also performing better than many developed countries on indicators such as measuring the closure of the gender gap and employment rates. 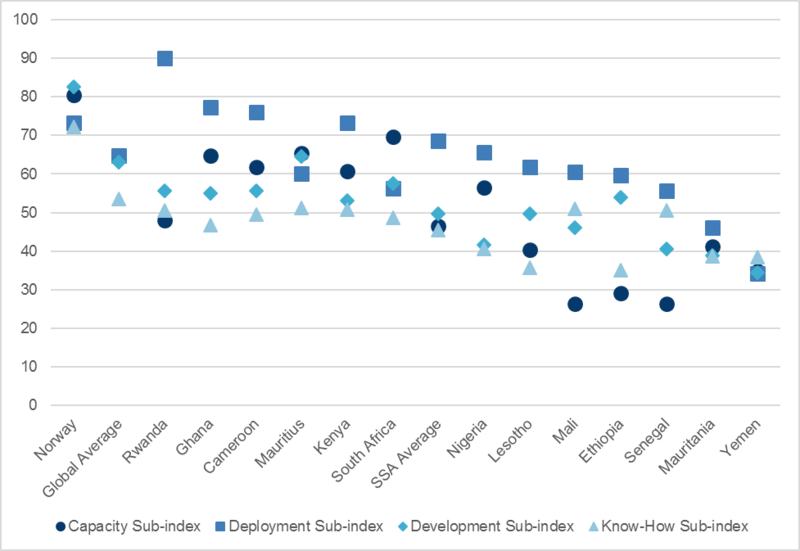 Overall, development remains the sub-index that needs the largest amount of work in the region. In order to close the gaps, sub-Saharan Africa will need large investments in education and increased efforts to integrate out-of-school students in order to avoid large losses in educational attainment. The report does not categorize Mauritania in sub-Saharan Africa.